"Vegan scrapple—isn’t that sort of an oxymoron?," wrote Mary Bigham in her West Chester Dish article. "I thought scrapple was one of those foods that converted meat eaters into vegans." She has a point. And yet, here we are reading about vegan scrapple. I was thinking about making a scrapple with chicken and as I explored that a little further, I realized that if I took the chicken out of it it was really a product that still tasted like scrapple. Woh! The pork is obviously a huge part of creating that scrapple flavor that we all love so much, but so is the flour filler, and especially the spices. Scrapple is nothing without those spices! So what happens if you take out the pork and just add the filler and spices? BOOM, vegan scrapple is born. Or wait, is it born, or just rediscovered? Back in March 2009, a scrapple dish made with vegan scrapple (known as "Vrapple") came in second place at Scrapple Fest in the Reading Terminal Marketing in Philadelphia. Their vegan scrapple dish beat out 7 other meatful competitors. 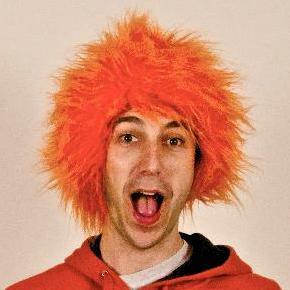 Vrapple was created by Sarah Cain back in 2008. Sarah had tried scrapple just once before creating Vrapple, but, as she told Philadelphia Weekly shortly before her second place finish at Scrapple Fest, "she relied on input from friends with a 'greater scrapple background.'" They helped her land on a creation that looks a lot like scrapple but just has seitan, cornmeal and buckwheat, cane sugar, canola oil, and her own mixture of spices. Like scrapple, when fried, it's crispy on the outside and creamier in the middle.And, of course, while it does succeed in combining sweet and savory notes, it doesn't have the unmistakable taste of pork. Do with that as you will. I must admit I am intrigued and might have to try to get my hands on some vegan scrapple. 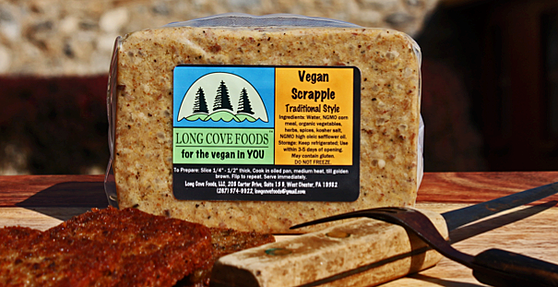 Have you had any experience with Vegan Scrapple? Have you tasted it? Tell us all about it in the comments! 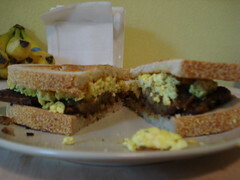 Image of Vrapple sandwich by Rory Connell.